Ben and I had been cooped up in the house for way too long this past July so we decided it was high time for an adventure. Occasionally, we go off for an afternoon and hunt for whatever random sights strike my fancy with the aid of a guidebook and trusty MapQuest directions. 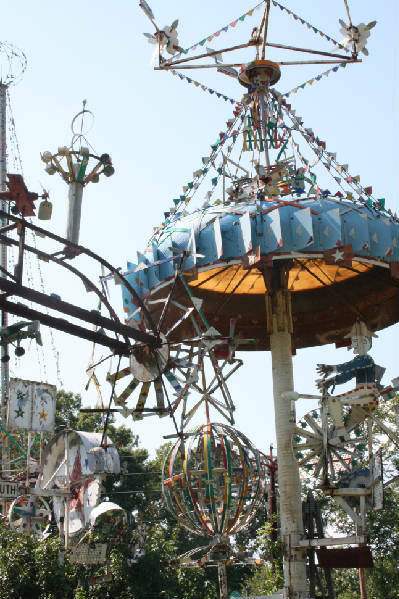 A quick visit to Roadside America revealed that a farm in Lucama, about an hour away, exhibited the creations of folk artist, Vollis Simpson. What might these be, you ask? Whirligigs! For those of you who have never heard of such things, my completely un-researched definition is that a whirligig is a bunch of metal crafted into artwork and hung on the top of large poles to blow and chime in the wind.Two more curiosities were located within ten miles of the whirligigs and so our route was mapped. 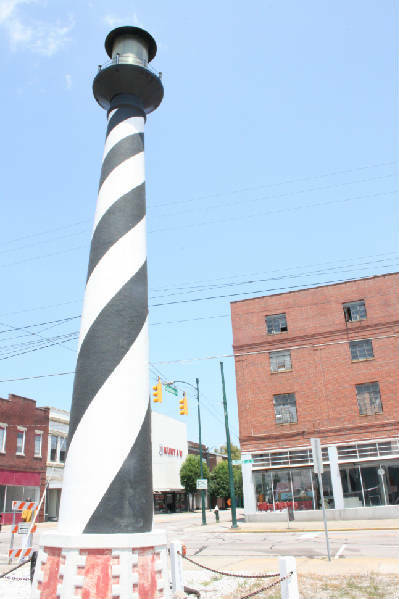 We drove first to downtown Wilson to seek out the largest reproduction of the Cape Hatteras lighthouse that exists.Having seen the actual lighthouse on the Outer Banks, I can tell you that it’s definitely a pretty tower and worthy of reproduction with its barber pole stripes. 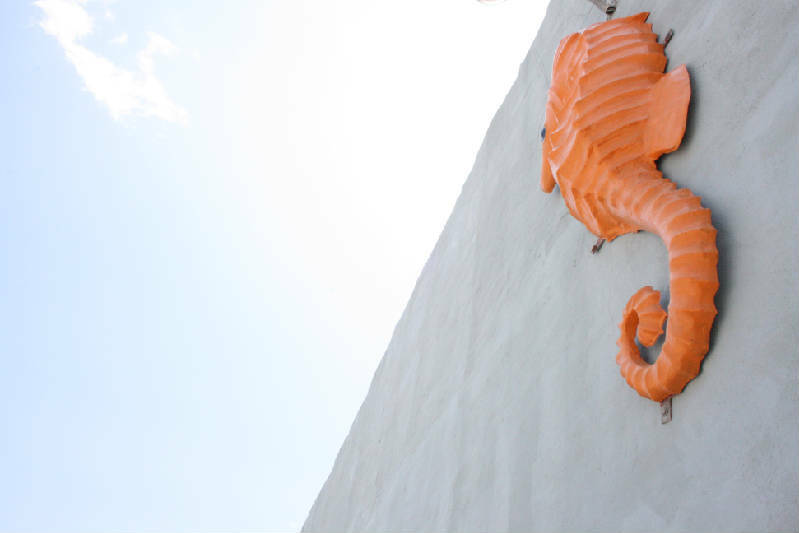 The model is located in the parking lot of Worrell’s Seafood Restaurant on Goldsboro Street.You can’t miss it as you drive into the main strip of town. 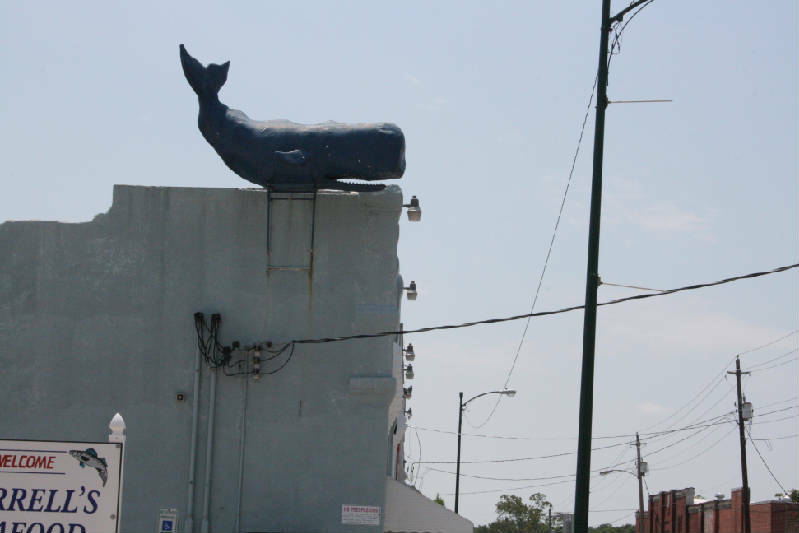 Our information neglected to mention that Worrell’s also displays giant sea creatures on the top and sides of the building. The whale looked ready for a swim. There were also seahorses and a marlin on the side of the building.While lighthouses have their charms, I was more delighted by these friendly sea creatures. I’d planned that we would get lunch in Wilson but as often seems the case on a Sunday in Small Town, North Carolina, everything was closed.We happened upon a sandwich and shake joint on the way to our next stop and were thrilled to discover what just might be the smallest miniature golf course I’ve ever seen. Putt Putt of Wilson is about twice the size of our basement, but I’ve yet to come across a course I haven’t enjoyed playing.Ben won by a stroke. Someday, I will reclaim the crown. 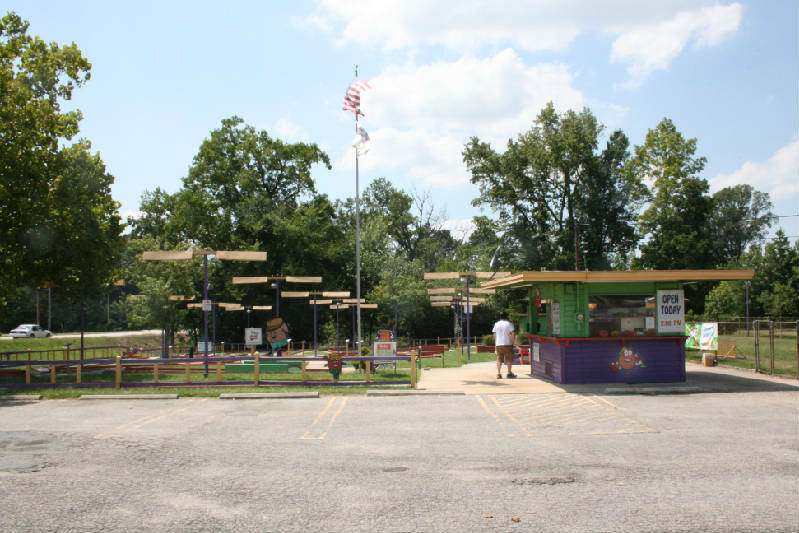 To find the whirligigs, we drove down the long country road, Wiggins Mill. You know you’ve reached them once you see giant metal structures loom over the side of the road.We turned onto the next street after sighting them and parked by the gate on the right. 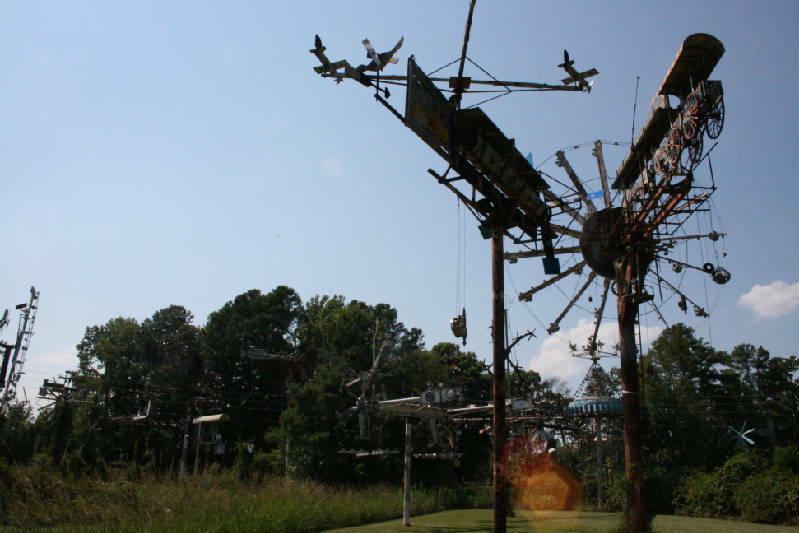 As long as the gate is open, visitors are welcome to come in and admire the whirligigs. This is the first view once in the park area. This is my favorite shot of the creations. Makes me want to go find a fair! 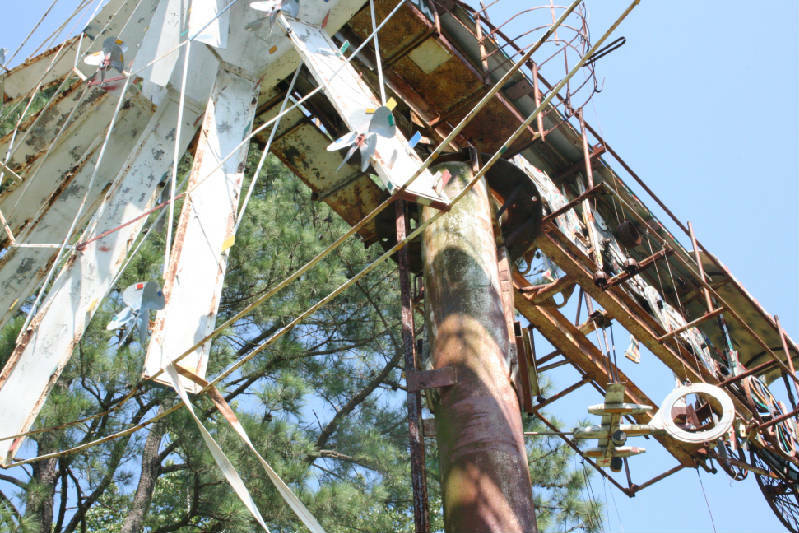 And this is a closer-up view of one of the whirligigs. I’m impressed that Mr. Simpson has the patience to put these together. But then, I’m also impressed when someone has the patience to sew a hemline or iron a pair of pants. Our last stop was Donnie’s Corvette Specialists in Kenly, where a very shady character has taken up residence. 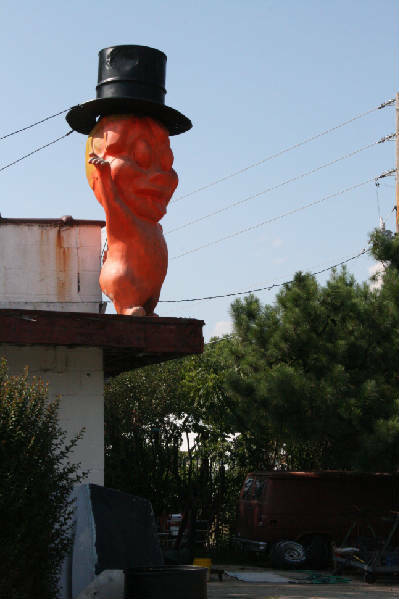 According to Roadside America, he is a relic from a Tastee Freeze ad campaign in the 1950s. I don’t know how much ice cream the fellow sold, but I was glad to be speeding away from him as soon as the pictures were snapped. Day-Glo Orange is not a good color on anyone. Many more photos are on our photo website, of course.If you’d like to browse, hit adventures, and then select whirligig adventure at the end of the list.Ben did a redesign on the site, so let us know any feedback you may have!To view the comments, you press the plus sign on the right side of the screen. Coming up, wedding trips in New Jersey, Washington DC, and my ten-year high school reunion in California. Will I be sick of traveling by November? Never! Excellent content…keep up the good work!